Netflix’s ‘The Chilling Adventures of Sabrina’ offers a darker, more dramatic parallel to the 90’s sitcom. Sabrina Spellman was a household name for any kid growing up in the late 90’s and early 2000’s. 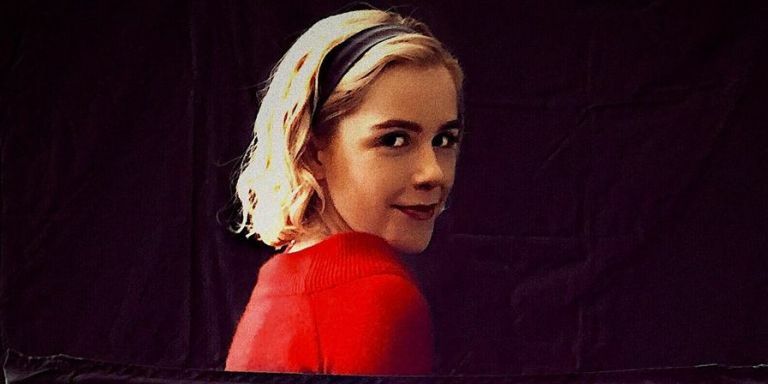 For seven seasons, the hit show ‘Sabrina the Teenage Witch’ followed the magical and comedic life of Sabrina as she navigated through high school, college and witchcraft. Sabrina may have road off into the sunset with her boyfriend, Harvey Kinkle, at the end of the series back in 2003, but 15 years later Sabrina is back…and darker than ever. Netflix’s adaptation, ‘The Chilling Adventures of Sabrina’, debuted on Oct. 26 and delivered a binge-worthy 10 episode series that’s filled with horror, drama and of course, magic. True to its predecessor, ‘The Chilling Adventures of Sabrina’ follows a teenage Sabrina (Kiernan Shipka) who has lived her life as a half-witch, half-human in the town of Greendale with her aunts Zelda (Miranda Otto) and Hilda Spellman (Lucy Davis). However, on her sixteenth birthday, Sabrina must undergo her “dark baptism” and decide whether to give up her abilities as a witch to fully embrace a mortal life or sign the Book of the Beast to become the powerful witch she was destined to be. Just from the first episode, fans of the 90’s classic will notice that the 2018 reboot takes a much darker turn and focuses on the mysteries and dangers of magic. We also meet new characters, get introduced to the town of Greendale and learn the origin story of the Spellmans. With the perfect balance of thrill and gore, the new show strays from a comedic, sitcom-like story. We still see Sabrina struggle with problems created by her own magical antics, but this time we don’t find humor in them. Instead, we’re engulfed in the drama as Sabrina learns just how dangerous her consequences can be and how fragile the mortal world is. From demons and resurrections to cannibalism and the Devil, the show appeals to a more mature audience who are fans of horror and the supernatural. Witchcraft is portrayed in a whole new light in the series. Gone are the days of finger waving and rhyming spells; now we see quite a religious interpretation of magic: satanic symbols, references to the “Dark Lord” and a “False God”, and human sacrifices. This sinister depiction of magic helps bring together the dark mood of the Netflix original. Perhaps one of the biggest differences of the new show from the original is its congruence with Sabrina’s story in the Archie Comics. Unlike the 1996 Sabrina who doesn’t acquire her magical abilities until her sixteenth birthday, the 2018 Sabrina had magic since birth, following suit to the comic book Sabrina. We also get to see the bewitching town of Greendale, filled with haunting mines, abandoned churches and enchanting forests. The original show strayed from the Archie Comics’ setting and took place in a fictional town in Massachusetts. It’s no surprise the show mirrors its comic book origins so well with Roberto Aguirre-Sacasa as executive producer who also produces The CW’s ‘Riverdale’. There’s even reference to the town of Riverdale in the show. Is this foreshadowing a crossover? While there is only one season out on Netflix and a much larger story still to be told, we’ve already been introduced to a number of new characters. Perhaps the most dynamic is Ambrose Spellman (Chance Perdomo), Sabrina’s cousin who is magically bound to the Spellman residence. Ambrose’s metrosexual portrayal is refreshing in the sense that it’s not what defines him; it just adds to his mystery. While we see him romantic with another warlock, there is also a scene in which he is partaking “pleasure” with a group of witches and warlocks. Main antagonists, Father Blackwood (Richard Coyle) and Prudence Night (Tati Gabrielle) are the thorns in Sabrina’s side as they mask what seems to be fear of her unknowing power with constant jabs at her half-witch status. With one official season under its belt, Netflix’s ‘The Chilling Adventures of Sabrina’ is just that…chilling. This is not your typical high school drama TV show. Although placed in a supernatural world, Greendale and the life of Sabrina seems so real. Being stripped of family-friendly visuals and comedy allows this series to shine in a new light and engulf fans old and new. Closed: Win a copy of Feminists Don’t Wear Pink (and other lies) + a cute pin!